Superman leaps forward separating Lois, Jon and the Eradicator. The fight between Clark and the malfunctioning artifact cause harm to Lois, and Jon swears to break his power vows and kill Eradicator. Lois pulls him back and reminds her son he can rise above the anger, he's the best of human and Kryptonian. He can be great if only he'd choose to be. Jon zips up his jacket and heat seals Krypto's cape to it before racing to help his dad. Father and son unleash a powerful punch each, one that literally knocks off Eradicator's head. Superman pulls Lois and Jon to safety as Eradicator releases everything trapped within him. Superman realizes everyone on Krypton, his parents, his aunt, his dog, are all still alive but are now being purged from Eradicator's body. The Eradicator swears they are all one and after replacing his head tries to unite everything related to Krypton. Meanwhile in the Ace O' Clubs bar, owner Bo 'Bibbo' Bibbowski and Gotham hitman Hacken are arm wrestling. The prize for the winner, a moon rock, supposedly from Krypton. Naturally, Bibbo wins much to the anger of Hacken and the 'Sooperman' shrine Bibbo has made gains its newest piece of memorabilia. Supernatural energy explodes over Suicide Slum and suddenly everyone from the Fortress has been teleported to the bar, drawn to the piece of space rock. The spirits begin possessing the customers in the bar, in the absence of their real bodies they begin trying to help Eradicator return them to life. Lois sees the rock and realizes it is the reason they've been drawn to Metropolis. With the help of Bibbo they hurl the rock as far from the club as possible. Suddenly with the rock away from them the 'ghosts' regain composure and release the humans they'd possessed. The spirit of Clark's father, Jonathan Kent, appears and helps his son regain his strength and inner peace. Clark is then able to speak to the Kryptonians who tell him they are at peace free from the Eradicator's prison. This peace lasts mere moments as Eradicator appears, fully regenerated and absorbs them all again. He then swears to free Clark's sanity by assimilating his 'half breed' son. Jon gears up for another fight but Clark teaches him another lesson. Learn when to stay and fight, and when to go. Superman races across the river towards the Metropolis Aquatic Research Laboratory and as he does some of the remaining spirits offer to buy him time by sacrificing themselves. The spirits all charge at Eradicator with such force they knock him back and force him to absorb them. Superman grabs a sub built for trench exploration and races away towards the moon. Hacken snipes that Superman is running away, but a confident Bibbo tells his pal that Sooperman has a plan! Story - 4: The action amps up this issue, but there are still some character moments with Jonathan Kent making contact with Clark, Krypto's spirit proving to be alive and Lois stopping Jon from losing control. Not only that but 1996's The Hitman character, Hacken and Bibbo are back and as bold as ever. The story in itself isn't bad, there isn't much to it, compared to the last three issues, but there is enough to carry it forward. The one jarring thing that is very tenuous is the jump from the Arctic to Metropolis. There are plenty of larger pieces of Kryptonite, two other Fortresses (Kara's undersea one and the mountain one), not to mention Kara herself and the contents of the DEO, oh and in Lexcorp or even The Block. But regardless we end up in the Ace O' Clubs. Odd but sentimentality overrides my 'poor plotting' niggles. I forgave them changing Krypto from a large saber toothed wolf back to a terrier (which by the way has yet to be explained). But this issue was all about sentimental moments. Lois paraphrasing Jor-El to Jon is a powerful moment for example, not to mention Jonathan Kent reaching out from the afterlife once more. Clark is also left with a massive dilemma, if he kills Eradicator, he kills everyone from Krypton, despite the zen attitude they adopt, if Eradicator lives there is a chance however small, that Krypton could return. When the action subsides I'm sure that is something Clark will struggle with. I came under fire last issue for marking the book down for the writers needlessly killing Krypto, I stand by it because all it seemed to serve this issue is for Jon to adopt the cape. I never review a book looking ahead in the solicits, so overall I still stand by that review regardless of whether Krypto returns. As I also stand by my mark down this issue for the Ghostbusters homage teleporting the action from one locale to another for no reason other than to link to a cultural movie reference. Art - 4: The art is very energetic. Powerful, fast and though spectacular, at times it seems that in order to keep the pace a lot of the details have been lost. For example, without some of the dialogue from Bibbo, Hacken and Lois, some of the sequences are completely a blur with nothing to explain what is going on. A little less haste to me would make all the difference I think. 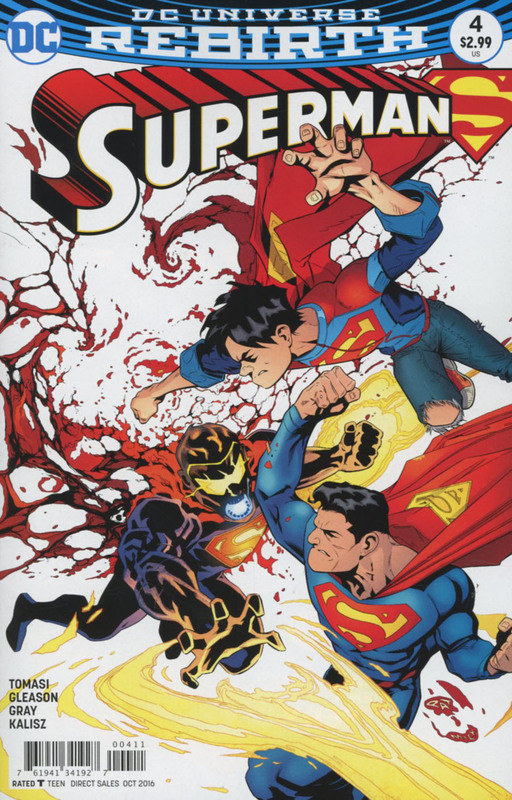 Cover Art - 4: Though it's good to see Jon and Clark side by side fighting, I can't help but see the white background and the design of the Eradicator flip flopping all over the place. I can see a vague formation of bat/demon wings with the cape shredding up in a bizarre fashion but some consistency would be smashing. Variant Cover Art - 4: I have been a bit harsh on the character stylings of Rocafort these last few months, with every issue showing a completely different physical appearance. 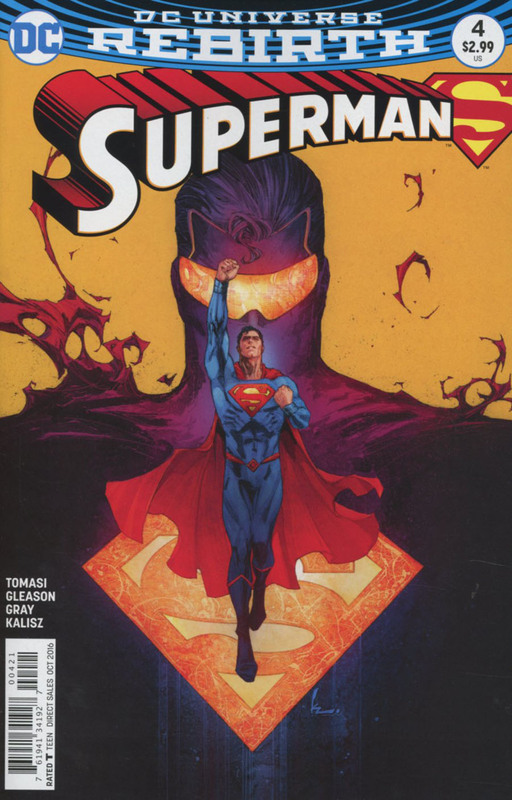 This issue however, we see a soaring Superman and the villainous shadow of the Eradicator. Remember last issue's cover of Superman soaring in the clouds? This is a vast improvement on that and the variants as a whole.